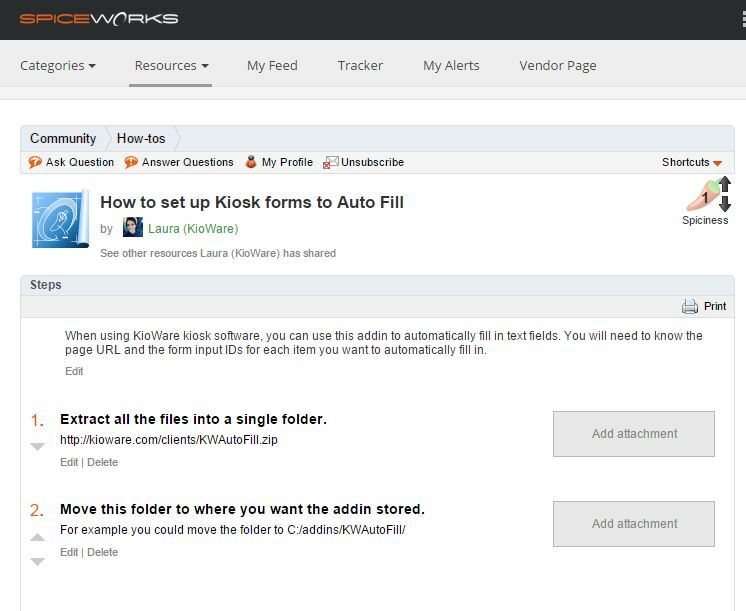 When using KioWare kiosk software, you can use this addin to automatically fill in text fields. You will need to know the page URL and the form input IDs for each item you want to automatically fill in. 1. Extract all the files from here into a single folder. 2. Copy this folder to where you want the addin stored. For example you could copy the folder to C:/addins/KWAutoFill/ - Copy, do not MOVE, as moving will create permission problems. 3. You now need to copy KWAddinUtilLib_KW.dll into your KioWare install directory. Example: C:/Program Files (x86)/KioWare/KWAddinUtilLib_KW.dll. NOTE: Use KWAddinUtilLib_KWL.dll for KioWare Lite and KWAddinUtilLib_KWB.dll for KioWare Browser. Also be sure to copy into the correct KioWare directory(KioWare vs Lite vs Browser). 4. Install the add-in from the Config Tool by browsing to the "KWAutoFill_KW.dll" file in the KWAutoFill directory. Browse to the one that ends with KWL if using KioWare Lite. 5. On the Browser tab, click the ".NET Addins" button. On this new window click "Add New..."
6. In the new window click the button label "..." beside the "Assembly Path" textbox. You then need to find and select the "KWAutoFill_KW.dll" file (or if using KioWare Lite select "KWAutoFill_KWL.dll"). 7. Now set the Class Name to by selecting "ADSI.KioWare.Addins.KWAutoFill" from the dropdown. 8. Set up: Open up Window's Run dialog. Find in the start menu or Windows Key + R.
9. Type in regedit and click "OK" or "Run". 12. Create a List of Lists. Example with it somewhat indented to give an idea of how the lists work (see table). All of the URL settings are regexes. Still have questions? Call KioWare Support at 877.843.4790 or 717.843.4790 to obtain developer assistance. Other addins and solutions can be found in our forum. This "How To" is also published at Spiceworks in their "How to" section.